One of those methods for rearranging ICE that is needed for the Whirlpool and Cell Portal style decks, and is great with Jinteki having a lot of positional ICE. The problem is that instead of playing cards that are good all the time, playing this card means cards are being played that are only good some of the time, and additional card slots are being used up to shore up those cards, making more cards that are only good some of the time. That is why it hasn’t seen any play, and likely won’t. There are three types of cards: The good, the bad and the janky. The difference between the latter two is the list of possible combos and pie-in-the-sky fantasy scenarios. Zaibatsu Loyalty for instance is bad. 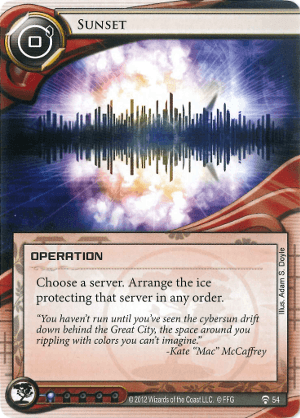 Not only does it not have a power that justifies slotting it for its own sake, it doesn't have any interactions with other corp cards that could make it part of a ludicrous combo or game busting 1:100 play. By contrast, Mumbad City Grid is jank, because if the stars align you can make the runner encounter the same Komainu three times in one run, which is AWESOME! Sunset recently got a promotion to serious jank status. Previously, it's best claim to jankitude was setting up combos with positional ice: Cell Portal and the like. But with the advent of AgInfusion: New Miracles for a New World, it suddenly has a new lease on life. Why? Because for AgInfusion every ice is potentially positional ice. Say you have a Chiyashi rezzed on your scoring remote. Ordinarily, that would be a significant but eminently overcomeable obstacle for the runner. But throw a couple of ice on top of it and then send them to the back with this card, and suddenly your remote is a seriously proposition. Now the runner has to break Chiyashi before you fire your redirect power. It's like a Nisei MK II counter that makes them encounter the Excalibur you've got rezzed on archives.